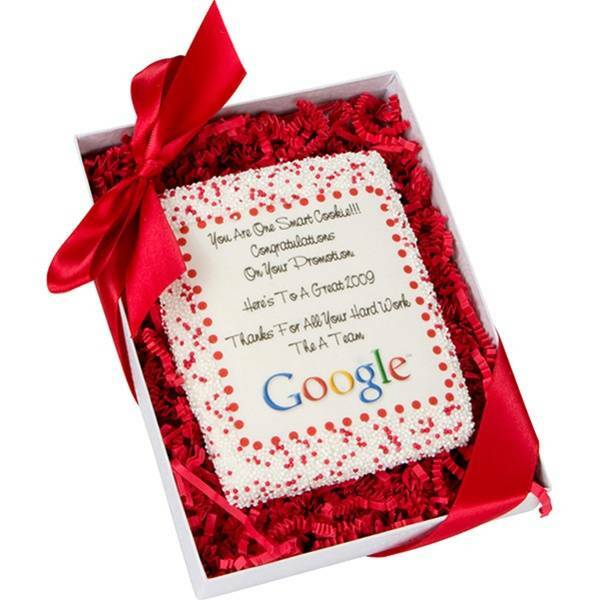 A large shortbread cookie iced and framed in sprinkles, with your message in edible ink on the front. Packaged beautifully with gift box and bow. Clear gift box and ribbon. Presentation is everything in corporate gifting. That first impression makes a big difference to whether the recipient remembers your gift fondly - or forgets it by lunch. These custom cookie cards are perfect gifts for when you need to make sure your message gets seen and remembered. 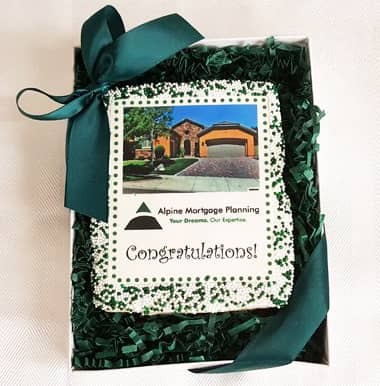 Whether it's a message of gratitude as part of an employee recognition program, thank you gifts for clients or part of an innovative marketing campaign, the edible cookie card is printed with fully edible and colorful ink. Unlike other bakeries online, we never use edible paper in any of our corporate gifts. Edible paper is easier to use, but it has a taste and texture we don't like. Plus, in certain circumstances edible paper has been known to peel. We developed our own printing method that lets us print directly onto the icing on these custom cookies, leaving them looking as great as they taste.